Remember how Pierce Brosnan, in his role as 007 in Tomorrow Never Dies, where he drove a BMW 750iL with a Sony Ericsson handset? Well, you might not be as suave and debonair as the dashing super spy, but you too, can live out your fantasy of driving your dream car with a phone, too. 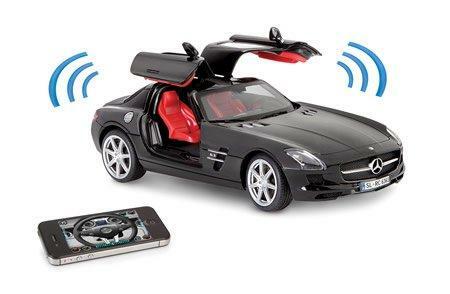 I am referring to the $129.95 iPhone Controlled Musical Mercedes SLS here, but there is one major difference between your Mercedes SLS compared to Bond’s BMW 750iL. The latter’s ride is the real deal, and can actually ferry you (and three other lovely ladies around), while the iPhone Controlled Musical Mercedes SLS is pretty much a toy. Still, I guess this is where you exercise the power of your imagination to get the job done. The iPhone Controlled Musical Mercedes SLS will also enable a smartphone’s personal soundtrack to accompany luxury grand tours, where a free app enables you to send the Mercedes SLS all over the floor (within range, that is) as music continues to play via the iPhone. Whenever the tiny ride stops, its gull wing doors will pop open and music will then be streamed to the car’s onboard speakers, how cool is that? The Mercedes SLS will also be able to move and flash its lights in tempo with the music in order to deliver a fully synchronized joyride. Motion-sensing accelerometers in the iPhone would enable one to accelerate forward or backward, while turning the car is as simple as tilting and panning your smartphone. Other interactive capabilities include the ability to illuminate the car’s turn signals, brake lights, headlamps, and interior light.